Arcadia runs through June 16. I was happy to discover the nuances of the Val/Hannah relationship. How they communicate, the depth of the feelings between them, and the growth of their professional partnership. Carey [Perloff, the director,] was very clear in wanting this relationship to be unique in the play, and I think we've done that. 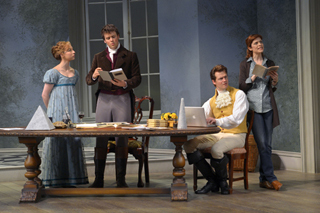 (from L-R): Rebekah Brockman (Thomasina Coverly), Jack Cutmore-Scott (Septimus Hodge), Adam O'Byrne (Valentine Coverly), and Gretchen Egolf (Hannah Jarvis) in A.C.T. 's production of Tom Stoppard's Arcadia, directed by Carey Perloff. 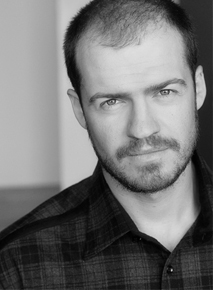 Photo by Kevin Berne. What is the most difficult aspect of speaking with an accent? Do you use any fun tricks? For me, the accent comes pretty naturally, but I still have to drill it to the point that I never have to think about it. If I'm thinking about how to say specific words, then I'm not doing my job of playing the scene. I'm a mimic when it comes to accents. I like to find an accent that does something for me artistically and then adopt aspects of it for my character. What is your favorite part of working on a Stoppard play? The words. Best thing about good writing is that if you get stuck as an actor the easiest way out is to just say the next line. A great playwright will always take care of you. I feel very taken care of in this role.